In 1995 I went to see Devil in a Blue Dress, starring Denzel Washington, with a group of friends in Denver, Colorado. I laughed hysterically, while the crowd I went with laughed casually, while the other guests watched unmoved by the scenes as I was. I thought it was the funniest movie, and a few year later I watched it again, laughed, but not as strongly as the first time. In 2014 I went to Guardians of the Galaxy twice. Once with friends, and once with the kids. The first time I went with my friends the entire cinema was laughing out loud, hitting every note, climax and joke. When I saw the movie again with the kids, They laughed, but it pails in comparison, and those were my kids doing the laughing, the crowd made me feel like they have all watched the movie before. They were unmoved. You see, New Years celebration is only as good as your crowd, and the bigger crowd you surround yourself with and their vibes. 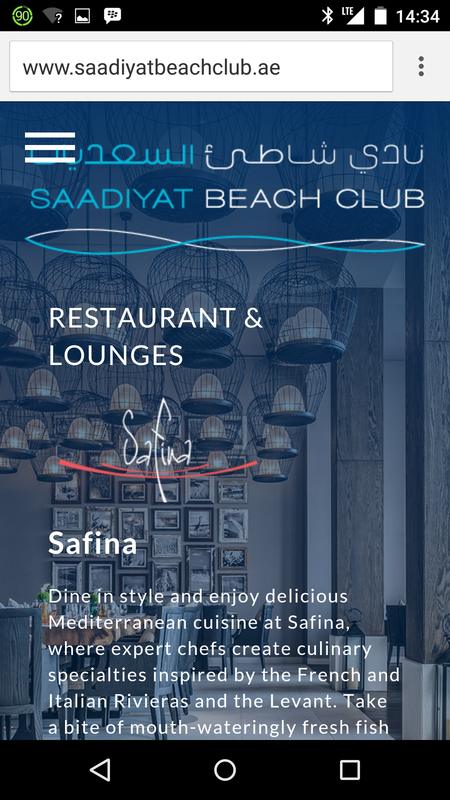 We kicked it off with a 6 meal course dinner at a restaurant called Safina, at Saadiyat Beach Club. The food was delicious, Every piece was succulent. My compliments to the Chef! The DJ was building up a storm, and the crowd was lining up. We ended up with a lobster, the desert was OK, but in general, it would be someplace I would go to for a special evening. It also seemed like a place we should not have moved from. It was outdoor, a bit upscale, the only issue is that the music sounded more of the 80s and 90s. The only thing I would watch out for is the taxi. One group had the taxi take them off course by 5 Km, and had to return back in reverse. The other taxi driver, dropped us off at the Saadiyat Golf Course Club where we would have been stranded for sure. We then moved t o the One, in Yaas Island for the final destination and countdown for the New years. At 11:30 it felt like we were the first ones in. What a shocker! The inside was beautifully done with white as if it snowed. The Big screen TV all around the club had no impact on me personally, but I could see what people spoke of. The screen lacked the details that we see today on the new generation TV sets. At 12:00 we had to scream at the DJ to start the countdown, and even then it was not as full as I expected it. The bouncers were polite and on point. The bathrooms were clean and well serviced. The DJ I would personally throw out if it was my club. He just could not get the people to want to dance once they decided to sit because that great song just got played. We stayed till 3 pm, then we decided to leave, to find out that finding a cab, would be another big task! The next day we continued with a Lunch/Brunch at the Mangroves, BOA Steakhouse, and dinner at Iris at Yaas island. Both had exceptional food quality. We could not complain except for the long wait on the food at the BOA steakhouse, for us to find a steak well done, instead of pink on the inside, which they corrected in 15 minutes. I had a grilled sea bass. Nothing was left from it! The manager was a french guy how was very friendly and took a great deal of time to make sure that everything was up to par. We finally ended our new year celebration the next day with a brunch at the Ritz Carlton hotel. If you like brunches, and hotel food, save your time and money and try this brunch for size. It is exceptionaly divine. This is our second time. It is pricey but worth it, around 120 USD per head if you go dry. I would elaborate further, but i would not want to hurt the surprise of those attending the feast. Make plans to have a crowd and to stay till 5 pm, and be there at 1 pm. Remember it is only on Fridays, and you need to make a booking especially for outside seatings. Happy New Years to you all. A happy 2015 to come and to happen with Gods blessings, to have a healthy life, admirations and positive goals. Keep the good smiles coming. And remember that places and the food is not what makes or breaks the celebrations, it the good people you surround yourself with.